H.C. Gildfind is a writer who lives between Melbourne and the Otways. Gildfind has published fiction, poetry, essays and book reviews in Australia and overseas. The Worry Front (Margaret River Press), an unsettling and fresh collection of short stories, is Gildfind’s debut book. In conversation with H.C. Gildind, we talked about the process of writing, publishing and editing The Worry Front, Gildfind’s relationship to the short form, and the power of poetic devices in short stories. Journaling, poetry and short stories were all forms that I first wrote in. As I got more experienced, I focussed on short stories because they utilise so many poetic devices whilst being structured via the concrete, recognisable ‘moments’ of human experience that matter to me. Short stories’ concern with the smallness and transience of our physical and psychological experiences—and the meanings we attach to them—reflect my experience of living. I used to think (and I was taught!) that writing short stories was merely part of the ‘progression’ towards writing a novel, and novelists were the only fiction writers that mattered. Novels are still seen as the ‘zenith’ of literary achievement today, especially in Australia, but I think that’s slowly changing as more people realise that the short story is a unique, powerful and fascinating form in its very own right. Your debut collection, The Worry Front (Margaret River Press), came out in April this year. Can you walk us through the writing, editing and publishing process of the collection? The stories in this collection were written over many years. During that time, I sent my work out to literary journals in Australia and overseas, slowly building up a publishing history. When I finished my PhD, I applied for an Australia Council grant to develop my stories into a collection. I was very lucky to get that grant, and I used that year of writing to, alongside other stories, write my novella ‘Quarry.’ That novella went on to win the Griffith Review Novella Project III competition, which was a huge encouragement. By that time, I was sending my collection out to publishers everywhere. It got short and long listed in some unpublished manuscript competitions in America before it was accepted by Margaret River Press. This was very exciting—and a big relief! Little did I know, I was about to get put through editor, Josephine Taylor’s, ‘Literary Bootcamp.’ For about five months she busted my chops, subjecting me to the many ritual humiliations that editing involves: namely, having all my idiotic habits, obsessions, and endless mistakes pointed out to me! Drafting is a gruelling process, but luckily Jo is as kind, funny and reasonable as she is astute and conscientious. I was then asked to read proofs and give input into the book design. Finally, the book was printed. It was surreal getting my copies in the mail, and I’m really happy that it’s such a good-looking book—thanks very much to Susan Miller, who designed it! The role of language plays an important part in The Worry Front, especially the use of poetic language. What role has poetry played in the creation of your short stories? Poetic devices like alliteration, rhythm, repetition and line length allow a writer to do what musicians do—which is to use sound to provoke feelings in an audience that cannot be provoked in any other way. As Flannery O’Connor says, a story is ‘experienced meaning’—in other words, if a story is any good, the only way to know what it means is to read it. You cannot reduce its meaning to a statement: if you could, why bother writing it? The aural devices of poetry thus allow a prose writer to tap into the most primitive parts of a reader’s being: they are like the ‘sound track’ in a movie, directing a reader’s body to understand things (through feelings) that their brain cannot grasp with words. Powerful stuff! By understanding the power of language’s ‘sound,’ poets and short story writers naturally have a great interest in the nature of language itself. This has everything to do with our concern with the fluidity and impermanence of meaning: that is, our acute awareness that language both allows us to—and stops us from—expressing and understanding so much. This is why imagery and metaphor also matter to us, for they are another indirect means through which we can evoke and suggest meanings that simply cannot be expressed directly through words. Finally, poets and short story writers have a tonne of respect for readers. We will not spoon-feed them ‘meaning’—as if they’re lazy idiots! For me, the power of literature does not derive from a passive consumption of prefabricated meanings or mindless, forgettable entertainment—but an active confrontation with the world, forced by one mind colliding with another via language. The intensity, compression and elliptical nature of short stories is ideal for forcing this confrontation. Your stories bring about a sense of psychological unease within your readers; there exists an uncomfortable feeling, but we can’t stop reading. What made you decide to write about the darker, more disturbing, aspects of life and humanity? I really don’t try to focus on the dark and disturbing, however, ‘trouble’ is what people need help with in their lives—and trouble is interesting! Mostly, I write to explore the fundamentally human experience of ‘ambivalence,’ for we live in a society where ambivalence is not permitted. Life’s hard, even in the best of circumstances, and it is the conflict between who we are on the ‘inside’ and who we’re coerced or seen to be on the ‘outside’ that interests me, for this conflict profoundly defines (and distorts) much of our psychological and social experience. If my stories ‘argue’ for anything, it’s this: that we cannot help being what we are, and that what we are is complex and contradictory and neither ‘good’ nor ‘bad’. We must be allowed to feel what we feel, and think what we think. How can we understand anything (let alone change or improve things) if we deny the internal realities that, ultimately, create the external realities that all of us have to live with? In 2012, you won an Australian Postgraduate Award to complete a PhD at the University of Melbourne, where you explored the relationship between Australian literature and history. Can you tell us a bit about your research and if it has shaped your writing? For my PhD I wrote ‘A history of 1936’ based solely on the hugely circulated magazine, The Australian Women’s Weekly. I then did a ‘creative reading’ of two novels that were published in that same year (Eleanor Dark’s Return to Coolami and Dymphna Cusack’s Jungfrau), using my research as a ‘historical window’ through which I could look at the novels and hypothesise about their original and intended meanings. This ‘New Historical’ approach is fascinating, and I value it because I’m very wary of people who hijack other writers’ texts and interpret them to suit their own agendas irregardless of the time, place and people in which, and to which, those texts were originally written. A PhD teaches researching, thinking, and writing skills that are phenomenally useful for everyone working in every field. It also teaches writers to ‘keep at it’ when the going gets tough. A thesis is as long as a book, and creating that unified, coherent document from so many complex and disparate parts is a great way for a writer to learn their craft. Also, I found my PhD so sickeningly daunting that I often avoided it—by writing short stories. This taught me the power of ‘productive procrastination’! Ultimately, for me, creative writing is like ‘cardio’ and academic writing is like ‘strength training’: your brain needs both, and each activity significantly benefits the other. Can you tell us anything about the novel you’re currently working on? 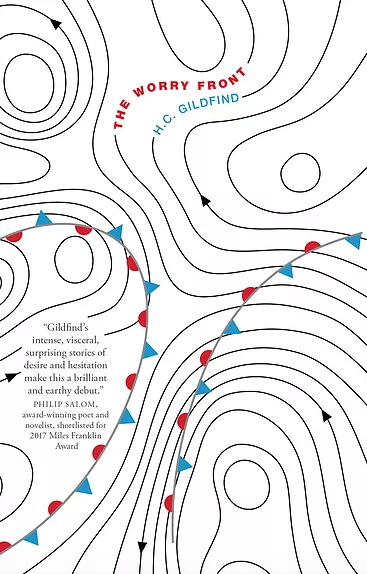 H.C. Gildfind’s The Worry Front was completed with the support of an Australia Council Grant and includes the award-winning novella ‘Quarry’. Gildfind has also researched interwar Australian literature and history. H.C. Gildfind will be on two Festival panel sessions: ‘Coast to Coast with Emerging Writers’ and ‘The Ventriloquists’. Find out more info on Gildfind’s sessions here!